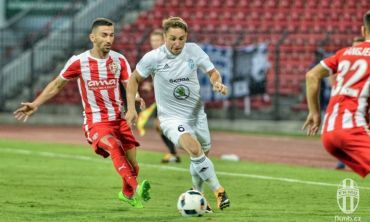 The Mladá Boleslav players were close to beating the undefeated Sparta, but they lost the lead in the last five minutes when they conceded two goals. Mladá Boleslav did not win a single point in the spring season. Sparta started the game actively, creating three early chances to score, the best one by Sionko. Mladá Boleslav went into a first half lead after a wonderful goal scored by Kulič. In the 26th minute he collected a pass from Zahustel, dribbled between Brabec and Hoheneder, sent the goalkeeper Blažek sprawling to the grass before placing the ball inside the right goalpost - 1:0. It was Kulič' tenth goal in the current Gambrinus league season. Less than ten minutes before break, Mendy missed a great opportunity to increase the lead from a Hrdlička cross. Sparta leveled the score in the 86th minute when Kušnír turned the ball in from a corner kick - 1:1. At the beginning of the 3 additional minutes of time, Mladá Boleslav turned the ball over in attack as Poláček's pass missed its target allowing Sparta to counter-attack. The attack saw Sparta's pressure earn a corner kick and send the ball back into the goal area. Miller punched clear only to see Sionko hit the back into the Mladá Boleslav goal in an acrobatic fashion - 1:2. FK Mladá Boleslav team: Miller - Kalina, Procházka, Kúdela, Hrdlička - Zahustel, Sylvestre, Opiela (Janíček 74), Poláček (Táborský 90), Mendy, Kulič (Chramosta 82). AC Sparta Praha team: Blažek - Kušnír, Řepka, Brabec, Pamič - Sionko, Vacek (Kadlec 62), Hoheneder (Krejčí 84), Kucka, Žofčák - Lačný (Wilfried 56). Goals: Kulič 26 Kušnír 86, Sionko 90.